Some common side effects of contraceptive pills include intermenstrual spotting, nausea, acne, and breast tenderness among others. There are many types of birth control available for use, ranging from condoms to surgery. However, one of the most popular birth controls is the contraceptive pills, also known as birth control pills, or just simply, the pill. 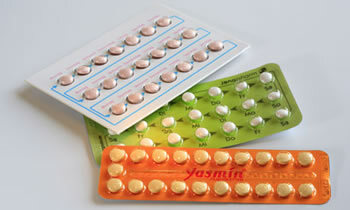 Contraceptive Pills are actually synthetic hormones, estrogen and progesterone. There are actually two different types of pills. One is the combination pill which includes both the hormones, and the other is the mini-pill, also known as the progestin-only pill which as the name suggests only contains progestin. The way contraceptive pills work is that they affect the hormone level in a woman’s body which makes it difficult to get pregnant. The woman must take the pill everyday and cannot miss even a single day, as even one missed pill increases the chances of pregnancy 30-80 times. In addition to contraceptives, the pill is also used to treat other medical issues, such as but not limited to regulation of menstrual periods, irregular periods, heavy periods, painful periods, etc. In fact, they may also be used to prevent ovarian and endometrial cancers. However, unlike condoms, they do not prevent STDs.